This week’s featured exchange-traded fund (ETF) is a new one from the State Street Group that focuses on income allocation. The fund, SPDR SSgA Income Allocation ETF (INKM), invests in a number of other ETFs and seeks to provide investors with stable income. The fund’s prospects are difficult to gauge because it is less than two months old. However, INKM has started to attract money from investors. If the current trend continues, it could provide sufficient liquidity to merit consideration as a potential recommendation for those who seek a steady stream of income. 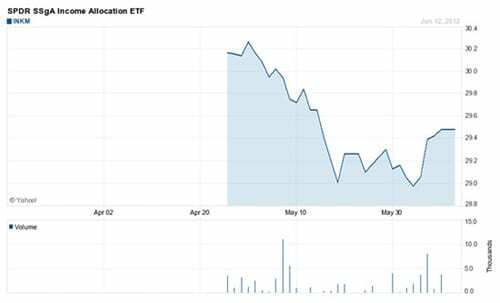 INKM has fallen since April 2012 when it first started trading. However, the markets in general have been slumping since that time. The fund opened traded at $30.01 on April 26, slid as low as $28.87 in midday trading on June 5, but has been climbing in recent days to hit $29.56 as I wrote this afternoon’s feature. The SPDR SSgA Income Allocation ETF (INKM) seeks to provide total return to investors by focusing on income and yield-generating assets. This fund could prove attractive to income-oriented investors, since it currently has a 30% exposure to investment-grade bonds, which limit its volatility, compared to many other funds. This stability is enhanced by the freedom that INKM’s fund managers have to deploy its portfolio in lower-risk securities during periods of high market volatility. If you’re like me, stability is hard to pass up in today’s uncertain market. As of June 12, INKM’s top five holdings were: SPDR S&P Dividend ETF (SDY), 19.04%; SPDR Barclays Capital Long Term Corporate Bond ETF (LWC), 14.07% ; SPDR Barclays Capital High Yield Bond ETF (JNK), 8.30%; SPDR Barclays Capital Long Term Treasury Bond ETF (BWZ), 7.90%; and SPDR S&P International Dividend ETF (DWX), 7.89%. The fund’s asset class allocations, also on June 12, were: Equity, 45.99%; Investment Grade Bonds 30.1%, High Yield, 8.32%; Hybrids, 8.05%; and Global Real Estate, 7.54%.